To emphasize the demand that the state of New York adequately fund the City University of New York and give the Professional Staff Congress a decent contract, 41 members of the PSC and their supporters, including two City Council members, Inez Barron and I. Daneek Miller, staged a die-in in front of the Third Avenue office of Gov. Andrew Cuomo March 24. Five hundred members of the PSC, plus students and university workers represented by District Council 37, held a support rally across Third Avenue. The PSC has been without a contract for five years. DC37, part of the American Federation of State, County and Municipal Employees, hasn’t had a new contract for six years. 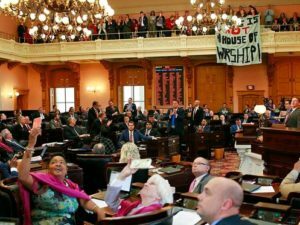 Die-in participants were arrested and got desk appearance tickets, which means they were not held in jail, but must show up in court to face charges. Before the die-in blocked the entrance to the building, a delegation from DC37 went to his office and presented him with a 5,000-signature petition demanding a decent contract for DC37 members. CUNY is the third largest public institution of higher education in the United States. 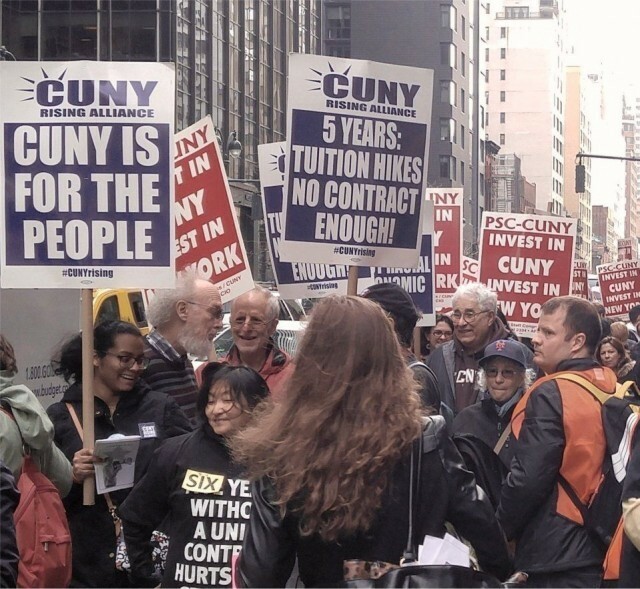 Counting full and part-time professional schools and institutes, CUNY enrolls around 450,000 students, overwhelmingly children and members of New York City’s working class. 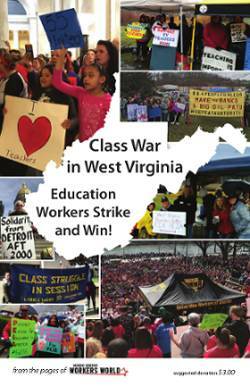 Seventy-five percent of its students are people of color; 40 percent were born outside the United States; 38 percent come from families with incomes below $20,000 a year; 30 percent work more than 20 hours a week for pay. (CUNY Office of Institutional Research) Almost all the students see a CUNY degree as an essential step for getting a decent job and a chance for a better life. Cuomo’s first executive budget, presented in January, shifted responsibility for a $485 million contribution to CUNY’s budget from the state to the city. This is about one-third of CUNY’s total budget. Cuomo’s step reneged on the state’s obligation to support CUNY’s senior colleges, which it assumed during the city’s 1970s financial crisis. Measuring from just before the 2008 recession, the amount of per-student state funding that CUNY receives has declined 17 percent, adjusted for inflation. But tuition, which goes into the state’s pockets before it gets returned to the colleges, has gone up $300 per student per year ever since Cuomo became governor in 2010. The reaction to Cuomo’s shorting CUNY’s budget by $485 million was so sharp that the day before the die-in, Cuomo announced he would fully fund CUNY. Like many reactionaries in the United States, the New York State Senate uses the charge of anti-Semitism to slander any struggle against the colonialist and pro-imperialist role of the Israeli state. Some Israeli and pro-Zionist newspapers have picked up this struggle against the SJP as part of their ideological offensive against the Boycott, Divestment and Sanctions movement and are trying to hold the education of the working class of New York City hostage.